Smart animals can be big trouble makers: New study – FIREPAW, Inc. It seems rather intuitive that if you are smart enough to survive and thrive among humans, you have got to be smart enough to stir up some trouble. That is precisely what researchers found in a new study that examined the cognitive abilities and personalities of wildlife troublemakers. You have probably encountered a raccoon raiding the trash in your neighborhood, seen a rat scurrying through the subway or tried to shoo away birds from your picnic. But have you ever wondered what makes these animals so good at living in suburbs and cities, and whether these same traits also make them such a nuisance? A new paper in the journal Animal Behaviour written by Lisa P. Barrett, Lauren Stanton and Sarah Benson-Amram, of the University of Wyoming’s Animal Behavior and Cognition Lab, takes an in-depth look at these questions. 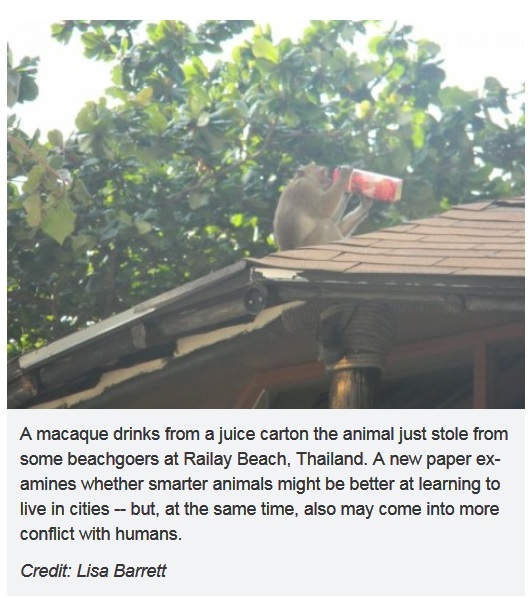 The researchers examined whether smarter animals might be better at learning to live in cities — but, at the same time, also may come into more conflict with humans. For example, crows’ memories allow them to predict and capitalize on sources of food, such as trash collection routines, but their memories also can bring them into conflict with humans when the birds strew trash on the street or congregate in agricultural fields or on buildings. The research team examined the potential role of animal cognition in different types of human-wildlife conflict, including wildlife killing livestock, stealing food, damaging property, colliding with vehicles, transmitting diseases and even killing humans. The researchers looked at cognitive abilities such as learning, innovative problem-solving, memory and behavioral flexibility. For example, elephants have been known to pick up and use trees to disable electric fences, and raccoons and kea, a parrot found in New Zealand, frequently open “animal-proof” trash bins. Learning to avoid human-made deterrents, including loud noises and bright lights, also helps animals get past barriers and access resources, rendering human-built blockades ineffective. The researchers also investigate how the personalities of different animals, such as an animal’s willingness to take risks or its attraction to new objects, may affect the ability of these animals to thrive near humans or in human-altered landscapes, such as cities. For example, bolder animals are more likely to approach humans in order to steal their lunches, and animals that are attracted to novel objects also are probably more likely to approach houses and cars.